Christine, we never had a dairy farm although we did have several cows that needed to be milked by hand. We just used the milk ourselves. But anyone who hasn’t lived on a farm could have no idea what that was like but I can sure sympathize with you, but only partially. Right through the story it was easy to read how much you really enjoyed it. I’m really enjoying reading these posts – bring back a lot of memories of trying, failing and trying again and finally succeeding. Once upon a time we too, only had one cow for our own milk (and our Candy dog and her 8 puppies), and our boss and his family. Kanute was an expert at hand-milking, and even the odd squirt into an eagerly waiting cat’s mouth. Can’t say I’m sorry to have had machines to milk our 30, then 65, then 80 cow herds. I can’t imagine being a dairy farmer! What a ton of work. When I was in grade school a teacher asked us who would prefer to live on a farm. There were only 2 of us who didn’t and the other one did live on one. I suppose the fact that animals make me sneeze as do things like grains could have a lot to do with it. This is a great read, however! Ohh Beth… allergy to animals. Just can’t imagine that. Perhaps it helped that I regularly shared the water in my dog’s bowl when I was just a toddler, and he washed my face up so well every time he greeted me, always hopeful of the goodies I might still be wearing. Maybe he gave me a lifelong immunity, along with his heart and soul? I’ve always lived in the city and I’ve always had pets. I have been to a couple farms, especially when my children were little. We took them to a working family farm in Vermont, where the husband and wife farmers, taught them how to milk the cows. It’s such a contrasted way of life from my own, and obviously laborious physical work. It also has its rewards as a way of life. Having always lived in or near a city this is totally foregin to me but completely fascinating. Especially intrigued by the part about winning a cow’s trust. Sometimes that trust was a mixed blessing Ken. One pet decided she wanted another mouthful of hay more than another cuddle and meant to just nudge me out of the way. Unfortunately, the pointy crop of her great head caught under my ribcage and she tossed me aside like a troublesome fly. Nothing was broken but my heart… but only briefly. She would never have deliberately harmed me. What an interesting memoir! And talk about hard work – I can’t even imagine. But I think your love of the place and the work really shines through in your writing. The stories of that work and that love continue to amaze… even me, A.K. It’s such a joy reliving them. I love the line, “Difficult to say which was greater, my amazement or my gratitude “. I sensed exactly how you felt at that moment. After reading this blog post, I honestly don’t think I know what physical labor is all about. You’re so right about the degree of physical labour, Pamela, and yet… the freedom is everything. Of course there are many constraints, especially revolving around a dairy routine, but you are your own boss, free to constantly make your own choices about countless things… and that, to us, has been the greatest part of our farming lives. The closest I ever got to a cow in my life was as a little kid. 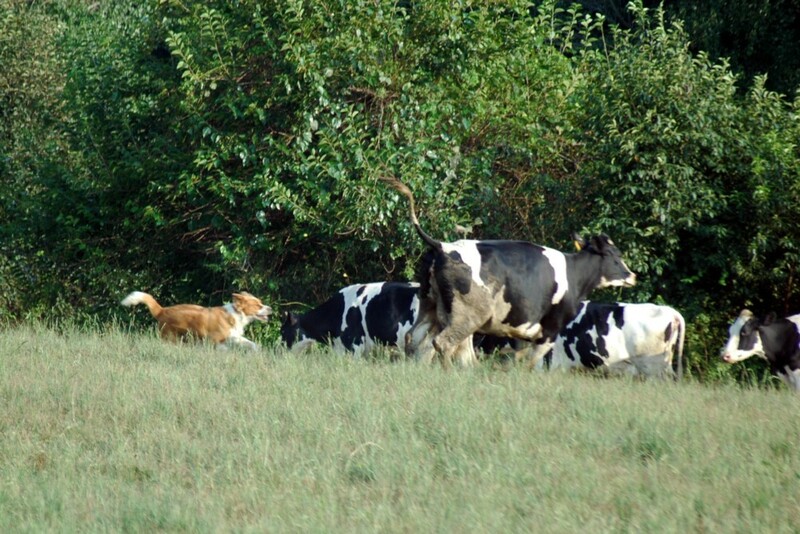 We lived in a semi-rural area and some neighbors had a cow called Bossy that we looked at over a fence. My dad liked to buy cow manure from her owners. That’s about it. I can see from your blog that living a farm life can provide an amazing education, of both the mind and the heart. But I guess it is different these days? “Small” dairy farms are mostly a thing of the past? Having ‘been there, done all of that’, you’re right on many counts Ramona. We found the best horses were the neighbour’s horses – there for a pat, but no responsibility or work. And sadly, yes the small family farm is in woefully short supply… along with the experiences of those times, those places. So thankful we have known them. I’m exhausted even looking back, Meredith. There’s much to be said for youthful exuberance and dogged determination! And yes, we have had many laughs… AFTER the events. I never lived on farm but one of my aunt lives and I see her the way she wins the confidence or trust of cow. I never tried to go near cow or even a goat. I am always very scared of them. I also sympathize to you about whole. I can understand that how much work it is on farm.